Grampy’s, at 296 Cambridge St., across from Massachusetts General Hospital, is the last gas station left in central Boston, and it may go the way of the nearby Bowdoin Square Exxon. Tim Powers anxiously gripped the steering wheel of a silver Toyota Corolla, one eye on an ominous light heralding an empty gas gauge. His girlfriend tapped on an iPhone, hunting for what has become curiously scarce in central Boston: a gas station. The iPhone guided the couple to Bowdoin Square Gulf on Cambridge Street, but the station had been shuttered long ago. The dashboard warned they had less than nine miles until their tank went dry. A block down Cambridge Street, Powers lucked upon Grampy’s, the last remaining fuel oasis in a growing gasoline desert in the heart of Boston. But Grampy’s itself is living on fumes: Architects are drawing plans for a five-story office building on the site, and construction could start early next year. If that day comes, and Grampy’s goes the way of a wrecking ball, it will leave a large swath of the city with no gas station, from the North End to Chinatown, Back Bay to Beacon Hill, and the Financial District to the West End. Land here, squeezed between glass high-rises and colonial-era brick buildings, is worth far more than the profits that flow from a fuel pump. The old Mobil near Boston Garden and Haymarket is now a blacktop parking lot. The North End long ago lost its station at Hanover and Commercial streets. Years have passed since the gas pumps disappeared from the foot of the Charlestown bridge. And the Beacon Hill Gulf on Charles Circle exists only in memories of the 1979 oil embargo, when the owner became the first gas station owner in the country convicted of federal price gouging. Boston is not the only place where gas stations are vanishing. Across the country, the number of gas stations has fallen roughly 14 percent since 1998, according to a survey by National Petroleum News magazine. But that does not mean drivers are buying less gas, according to Keith Reid, the magazine’s editor-in-chief. Gas superstores with sprawling fuel bays and aisles of groceries have absorbed the small mom-and-pop service stations that offered little more than a few pumps, a greasy mechanic, and a gum ball machine. But in urban centers, property is too costly to build a large, suburban-style gas station. 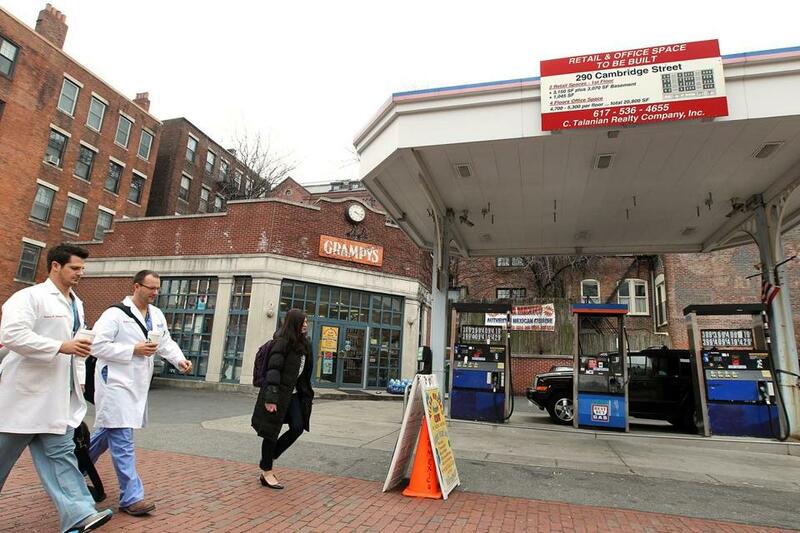 In central Boston, the last gas station - Grampy’s - sits across from the main entrance to Massachusetts General Hospital, which draws 50,000 to 60,000 visitors a day. But this week, few seemed to stop for gas at the eight-pump station, which charged $4 for a gallon of regular with a credit card when the citywide average was closer to $3.62. One of the gas station’s lights dangled from a wire. Vines snake across a sign on the brick facade that identifies it as Grampy’s, although Grampy isn’t around anymore. State business records identify the current proprietors as Georgis Fisseha and Mike Gahfou. A man at the station who identified himself as one of the current owners declined to provide his name. The owner of the property, real estate developer Charles M. Talanian, said that after almost a decade of false starts, his project, an office building approved by the city, is finally moving forward. The gas station tenants no longer have a lease, he said, and know their time is finite. There is one other option. A year ago, the city of Boston installed three electric-car charging stations near City Hall Plaza to encourage drivers to abandon gasoline-powered vehicles. The charging stations look like fancy parking meters with an 11-foot-long power cord coiled at the front. But that came as little comfort back down on Cambridge Street.